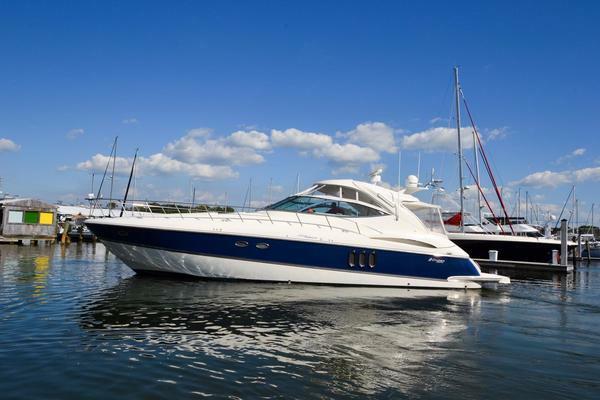 The 54 Eastbay is renowned for its sea keeping ability and for good reason. She is just as stunning to look at when she is moored in a harbor as she is impressive in a roiling sea. BRAND NEW Awlgrip hull and non skid. full Caterpillar service as well as several upgrades to the engine maintenance. Do not underestimate the Evolution drive system: it is a major upgrade to noise and the smoothness of the ride. Freedom lift for a good size dinghy. BRAND NEW bottom put on this spring...so clean and dry as only new can provide. I personally sold the boat new and was on board on multiple occasions inspecting the build at the GB factory. I have run the boat over 500 miles personally and have been aware of her history and maintenance program since new. There are NO skeletons in this closet~! This is just a stunning example of a great boat and one that will not last on the market as she is the only reasonably priced boat available. Double door entry into the salon, aft. Settee to starboard, two comfortable easy chairs to port. Two Stidd chairs, P&S, for helm and navigator. Galley is down to port, office to starboard. Guest cabin athwart ship with twin berths. Master with center line queen. Two heads. Shower with private entry from master as well as guest head.